Blickman, Tom 2018. Collapse of the Global Order on Drugs: From UNGASS 2016 to Review 2019. p. 101. All Party Parliamentary Group on Drug Policy Reform, ‘Guidance on Drug Policy: Interpreting the UN Drug Conventions’, August 2015. Ansley, N., ‘International Efforts to Control Narcotics’ (1959–1960) 50 Journal of Criminal Law and Criminology 105. Anslinger, H. J., ‘Report of Progress in Drafting the “Single Convention”, a Proposed Codification of the Multilateral Treaty Law on Narcotic Drugs’ (1958) 13 Food, Drug, and Cosmetic Law Journal 692. Aoyagi, M. T., ‘Beyond Punitive Prohibition: Liberalizing the Dialogue on International Drug Policy’ (2005) 37 NYU Journal of International Law and Policy 555. Barrett, D., ‘Unique in International Relations? : A Comparison of the International Narcotics Control Board and the UN Human Rights Treaty Bodies’ (International Harm Reduction Association 2008). Barrett, D., ‘Backgrounder: Bolivia's Concurrent Drug Control and other International Legal Commitments’ (International Centre on Human Rights and Drug Policy 2011). Barrett, D., ‘Intersections between the International Legal Regimes for Drug Control and Human Rights’ (Human Rights and Drugs Conference, Human Rights Centre, University of Essex, 8 February 2014). Barrett, D. and Nowak, M., ‘The United Nations and Drug Policy: Towards a Human Rights-Based Approach’ in Constantinides, A. and Zaikos, N. (eds), The Diversity of International Law: Essays in Honour of Professor Kallopi K. Kpufa (Martinus Nijhoff 2009). Barrett, D. and Tobin, J., ‘Article 33: Protection from Narcotic Drugs and Psychotropic Substances’ in Tobin, J. and Alston, P. (eds) A Commentary to the United Nations Convention on the Rights of the Child (Oxford University Press, in press). Barrett, D. and Veerman, P. E., ‘Article 33: Protection from Narcotic, Drugs and Psychotropic Substances’ in Alen, A., Lanotte, J. Vande, Verhellen, E., Ang, F., Berghmans, E., Verheyde, M. and Abramson, B. (eds) A Commentary on the United Nations Convention on the Rights of the Child (Martinus Nijoff 2012). Barrett, D., Lines, R., Schleifer, R., Elliott, R. and Bewley-Taylor, D., ‘Recalibrating the Regime: The Need for a Human Rights-Based Approach to International Drug Policy’ (Beckley Foundation Drug Policy Programme 2008). Bassiouni, M. C., ‘International Aspects of Drug Abuse: Problems and a Proposal’ (1975–1976) 9 The John Marshall Journal of Practice and Procedure 3. Bassiouni, M. C., ‘Critical Reflections on International and National Control of Drugs’ (1989–1990) 18 Denver Journal of International Law and Policy 311. Bassiouni, M. C., ‘A Comprehensive Strategic Approach on International Cooperation for the Prevention, Control and Suppression on International and Transnational Criminality, including the Establishment of an International Criminal Court’ (1991) 15 Nova Law Review 353. Bevans, C. I., ‘International Conventions in the Field of Narcotic Drugs’ (1963–1964) 37 Temple Law Quarterly 41. Bewley-Taylor, D. R., The United States and International Drug Control, 1909–1997 (Continuum 1999). Bewley-Taylor, D. R., ‘Challenging the UN Drug Control Conventions: Problems and Possibilities’ (2003) 14 International Journal of Drug Policy 171. Bewley-Taylor, D. R., International Drug Control: Consensus Fractured (Cambridge University Press 2012). Bewley-Taylor, D. R. and Jelsma, M., ‘Fifty Years of the 1961 Single Convention on Narcotic Drugs: A Reinterpretation’ (Transnational Institute Series on Legislative Reform of Drug Policies Nr 12 2011). Bewley-Taylor, D. R. and Trace, M., Stevens, A., ‘Incarceration of drug offenders: costs and impacts’ (Beckley Foundation Drug Policy Programme, 2005). Bland, J. O. P., ‘The Opium Abolition Question’ (1912–1913) 3 Journal of Race Development 302. Blickman, T., ‘A Beginner's Guide to Coca’ (Transnational Institute 2011). Blum, Y. Z., ‘Extradition: A Common Approach to the Control of International Terrorism and Traffic in Narcotic Drugs’ (1978) 13 Israeli Law Review 194. Bogaard, W., ‘Limits to National Penal Policies Concerning Narcotic Drugs as Set by the International Treaties: The Dutch Example’ (1975) 10 Journal of International Law and Economics 747. Boister, N., ‘The Suppression of Narcotic Drugs through International Law’ (PhD thesis, University of Nottingham 1998). Boister, N., ‘The Interrelationship between the Development of Domestic and International Drug Control Law’ (1995) 7 African Journal of International and Comparative Law 906. Boister, N., Penal Aspects of the UN Drug Conventions (Kluwer 2001). Boister, N., ‘Human Rights Protections in the Suppression Conventions’ (2002) 2 Human Rights Law Review 199. Bonnie, R. J., ‘The Virtues of Pragmatism in Drug Policy’ (2010) 13 Journal of Health Care Law and Policy 7. Bonino, E., ‘Crimes without Victims: Appropriate Policy Responses to Drug Use’ in Protecting the Human Rights of Injection Drug Users: The Impact of HIV and AIDS (Open Society Institute 2005). Borgen, C. J., ‘Resolving Treaty Conflicts’ (2005) 37 George Washington International Law Review 573. Buffard, I. and Zemanek, K., ‘The “Object and Purpose” of a Treaty: An Enigma?’ (1998) 3 Austrian Review of International & European Law 311. Campos, I., Home Grown: Marijuana and the Origins of Mexico's War on Drugs (University of North Carolina Press 2012). Cannizzaro, E. (ed), The Law of Treaties: Beyond the Vienna Convention (Oxford University Press 2011). Chatterjee, S. K., Legal Aspects of International Drug Control (Martinus Nijhoff 1981). Cohrerrsen, J. J. and Hoover, L. H., ‘The International Control of Dangerous Drugs’ (1974) 9 The Journal of International Law and Economics 63. Collins, J. (ed), Ending the Drug Wars: Report of the LSE Expert Group on the Economics of Drug Policy (LSE Ideas 2014). Collins, J., Regulations and Prohibitions: Anglo-American Relations and International Drug Control, 1939–1964, PhD thesis, Department of International History, London School of Economics London, January 2015. Collins, J., ‘Control of Dangerous Drugs’ (1930) 2/3639 British Medical Journal 572. Corten, O. and Klein, P. (eds), The Vienna Convention on the Law of Treaties: A Commentary, Vol. I (Oxford University Press 2011). Csete, J., ‘Overhauling Oversight: Human Rights at the INCB’ in Collins, J. (ed) Governing The Global Drug Wars LSE Ideas: Special Report (LSE Ideas 2012). Csete, J., ‘Costs and Benefits of Drug-Related Health Services’ in Collins, J. (ed) Ending the Drug Wars: Report of the LSE Expert Group on the Economics of Drug Policy (LSE Ideas 2014). Csete, J. and Wolfe, D., ‘The International Narcotics Control Board and HIV/AIDS’ (Canadian HIV/AIDS Legal Network/Open Society Institute 2007). de Londras, F., ‘The Right to Challenge the Lawfulness of Detention: An International Perspective on US Detention of Suspected Terrorists’ (2007) 12/2 Journal of Conflict and Security Law 223. Dikotter, F., Laamann, L. and Zhou, X., Narcotic Culture: A History of Drugs in China (University of Chicago Press 2004). Dorr, O. and Schmalenbach, (eds), Vienna Convention on the Law of Treaties: A Commentary (Springer 2012). Dorn, W. A., ‘The League Covenant and the UN Charter: A side-by side (full text) comparison’ (12 May 2008) Royal Military College of Canada. Drug Policy Alliance, ‘Drug Courts are Not the Answer: Towards a Health Centered Approach to Drug Use’ (Drug Policy Alliance 2011). Dupuy, P-M, ‘Evolutionary Interpretation of Treaties: Between Memory and Prophecy’ in Cannizzaro, E. (ed) The Law of Treaties: Beyond the Vienna Convention (Oxford University Press, 2011). Elliott, R., Csete, J., Wood, E. and Kerr, T., ‘Harm Reduction, HIV/AIDS, and the Human Rights Challenge to Global Drug Control Policy’ (2005) 8/2 Health and Human Rights 104. Elliott, R., Lines, R. and Schleifer, R., ‘Treatment or Torture? Applying International Human Rights Standards to Drug Detention Centers’ (Open Society Foundations 2011). Evans, M. D. (ed) International Law (3rd ed, Oxford University Press 2010). Fairbank, J. K., ‘The Legalization of the Opium Trade before the Treaties of 1858’ (1933–1934) 17 Chinese Social and Political Science Review 215. Fisher, K., ‘Trends in Extraterritorial Narcotics Control: Slamming the Stable Door after the Horse Has Bolted’ (1983–1984) 16 New York University Journal of International Law and Politics 353. Fitzmaurice, M., ‘The Practical Working of the Law of Treaties’ in Evans, M. (ed) International Law (3rd ed, Oxford University Press 2010). Fitzmaurice, M., Elias, O. and Merkouris, P. (eds), Treaty Interpretation and the Vienna Convention on the Law of Treaties: 30 Years on (Martinus Nijhoff 2010). Flacks, S., ‘Drug Control, Human Rights, and the Right to the Highest Attainable Standard of Health: A Reply to Saul Takahashi’ (2011) 33 Human Rights Quarterly 856. Fusero, M., ‘Conceptos Basicos para un Cambio de Paradigma Posible’ (2015) La Asociación de Pensamiento Penal. Gallahue, P., ‘The Death Penalty for Drug Offences: Global Overview 2011’ (International Harm Reduction Association 2011). Gallahue, P. and Lines, R., ‘The Death Penalty for Drug Offences: Global Overview’ (International Harm Reduction Association 2010). Gallahue, P. and Lines, R., ‘The Death Penalty for Drug Offences: Shared responsibility and shared consequences’ in Hodgkinson, P. (ed) The International Library if Essays on Capital Punishment, Volume III: Policy and Governance (Ashgate 2013). Gallahue, P. and Saucier, R., Barrett, D., ‘Partners in Crime: International Funding for Drug Control and Gross Violations of Human Rights’ (International Harm Reduction Association, 2012). Gardiner, R. K., Treaty Interpretation (Oxford University Press 2008). Gardiner, R. K., ‘The Vienna Convention Rules on Treaty Interpretation’ in Hollis, D. B. (ed) The Oxford Guide to Treaties (Oxford University Press 2012). Gearty, C. A., ‘Terrorism and Human Rights’  European Human Rights Law Review 1. Geraghty, A. H., ‘Universal Jurisdiction and Drug Trafficking: A Tool for Fighting one of the World's Most Pervasive Problems’ (2004) 16 Florida Journal of International Law 371. Gilmore, N., ‘Drug Use and Human Rights: Privacy, Vulnerability, Disability, and Human Rights Infringements’ (1996) 12 Journal of Contemporary Health Law and Policy 355. Global Commission on Drug Policy, ‘The Global Crisis of Avoidable Pain: Drug Control's Negative Impact on Public Health’, September 2015. Gregg, R. W., ‘The Single Convention for Narcotic Drugs’ (1961) 16/4 Food, Drugs and Cosmetic Law Journal 187. Gupta, J., ‘Interpretation of Reverse Onus Clauses’ (2012) 5/1 NUJS Law Review 49. Harding, J. L., ‘International Narcotics Control: A Proposal to Eradicate an International Menace’ (1984) 14 California Western International Law Journal 530. Harm Reduction International, ‘Commanding General Confidence? Human Rights, International Law and the INCB Annual Report for 2011’ (2012). Harrington, S. L., ‘Death, Drugs and Development: Malaysia's Mandatory Death Penalty for Traffickers and the International War on Drugs’ (1991) 29 Columbia Journal of Transnational Law 365. Harris, D. J., O'Boyle, M., Bates, E. and Buckley, C., Law of the European Convention on Human Rights (2nd ed, Oxford University Press 2009). Hedrich, D., Kerr, T. and Dubois-Arber, F., ‘Drug Consumption Facilities in Europe and Beyond’ in Rhodes, T. and Hedrich, D. (eds) Harm Reduction: Evidence, Impacts and Challenges (Publications Office of the European Union 2010). Heilmann, D., ‘The International Control of Illegal Drugs and the U.N. Treaty Regime: Preventing or Causing Human Rights Violations’ (2011) 19/2 Cardozo Journal of International and Comparative Law 237. Helmersen, S. T., ‘Evolutive Treaty Interpretation: Legality, Semantics and Distinctions’ (2013) 6/1 European Journal of Legal Studies 127. Hepburn, W. M., ‘International Legislation on Social Questions’ (1931–1932) 9 New York University Law Review 310. Hood, R. and Hoyle, C., The Death Penalty: A Worldwide Perspective (4th ed, Oxford University Press 2008). Hor, M., ‘Singapore's Innovations to Due Process’ (International Society for the Reform of Criminal Law Conference on Human Rights and the Administration of Justice, Johannesburg, December 2000) www.isrcl.org/Papers/Hor.pdf accessed 13 May 2014. Human Rights Watch, ‘Not Enough Graves: The War on Drugs, HIV/AIDS, and Violations of Human Rights’ (Human Rights Watch 2004), Vol 16, No 8 (C). Human Rights Watch, ‘“Skin on the Cable” The Illegal Arrest, Arbitrary Detention and Torture of People Who Use Drugs in Cambodia’ (2010). Human Rights Watch, ‘The Rehab Archipelago Forced Labor and Other Abuses in Drug Detention Centers in Southern Vietnam’ (2011). Hunt, P., ‘Human Rights, Health and Harm Reduction: States’ Amnesia and Parallel Universes’ (International Harm Reduction Association 2008). Hussein, M., ‘Abdullah Defends Death Penalty for Drug Traffickers’ Bernama Malaysian National News Agency (22 February 2006). Hyde, C. C., ‘Concerning the Interpretation of Treaties’ (1909) 3 American Journal of International Law 46.
International Drug Policy Consortium, ‘The International Narcotics Control Board: Current Tensions and Options for Reform’, International Drug Policy Consortium Briefing Paper (February 2008). International Harm Reduction Association, ‘What is Harm Reduction?’ (International Harm Reduction Association 2009). International Harm Reduction Development Program, ‘Human Rights Abuses in the Name of Drug Treatment: Reports from the Field’’, Public Health Fact Sheet (March 2009). Jelsma, M., ‘The Development of International Drug Control: Lessons Learned and Strategic Challenges for the Future’: Working Paper Prepared for the First Meeting of the Global Commission on Drug Policy (24–25 January 2011). Jenks, C. W., ‘The Conflict of Law-Making Treaties’ (1953) 30 British Yearbook of International Law 401. Jurgens, R. and Csete, J., ‘In the Name of Treatment: Ending Abuses in Compulsory Drug Detention Centers’ (2012) 107/4 Addiction 689. Kelsen, H., General Theory of Law and State (Wedberg, Anders tr, Harvard University Press, 1949). Kelsen, H., The Law of the United Nations (Stevens & Sons Ltd, 1950). Kelsen, H., General Theory of Norms (Hartney, Michael tr., Clarendon Press, 1991). Kiefer, H. L., ‘Just Say No: The Case against Expanding the International Criminal Court's Jurisdiction to Include Drug Trafficking’ (2009) 31 Loyola of Los Angeles International and Comparative Law Review 157. Klabbers, J., ‘Some Problems Regarding the Object and Purpose of Treaties’ (1997) 8 Finnish Yearbook of International Law 160. Lande, A., ‘The Adjustment of the International Opium Administration to an Eventual Dissolution of the League of Nations’ (1945) 45 Columbia Law Review 392. Legac, S., ‘The Negative Impacts of the Global War on Drugs: Can International Drug Enforcement be Successful Without Infringing on Human Rights?’ (2010) 3 Albany Government Law Review 823. Linderfalk, U., On the Meaning of the ‘Object and Purpose’ Criterion, in the Context of the Vienna Convention on the Law of Treaties, Article 19' (2003) 72 Nordic Journal of International Law 429. Linderfalk, U., On the Interpretation of Treaties: The Modern International Law as Expressed in the 1969 Vienna Convention on the Law of Treaties (Springer 2007). Linderfalk, U., ‘Doing the Right Thing for the Right Reason: Why Dynamic or Static Approaches Should be Taken in the Interpretation of Treaties’ (2008) 10 International Community Law Review 109. Lindesmith, A. R., ‘The Drug Addict: Patient or Criminal?’ (1941) 31/5 Journal of the American Institute of Criminal Law and Criminology 531. Lines, R., ‘The Death Penalty for Drug Offences: A Violation of International Human Rights Law’ (International Harm Reduction Association 2007). Lines, R., ‘A “most serious crime”? International Human Rights Law and the Death Penalty for Drug Offences’ (18th International Conference on the Reduction of Drug- Related Harm, Warsaw, 15 May 2007). Lines, R., ‘A “Most Serious Crime”? The Death Penalty for Drug Offences and International Human Rights Law’ (2010) 21 Amicus Journal 21. 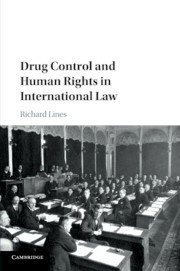 Lines, R., ‘“Treatment in Liberty” – Compulsory Detention for Drug Use and Human Rights’ (2016) 3 Journal of International Law and Drug Policy (in press). Lines, R. and Barrett, D., ‘The Human Rights “Win” at the UNGASS on Drugs that No One is Talking about, and How We Can Use It’ (Human Rights Centre Blog, University of Essex, 9 May 2016) hrcessex.wordpress.com/2016/05/09/the-human-rights-win-at-the-ungass-on-drugs-that-no-one-is-talking-about-and-how-we-can-use-it/ accessed 23 May 2016. Lines, R. and Elliott, R., ‘Injecting Drugs into Human Rights Advocacy’ (2007) 18 International Journal of Drug Policy 453. Lixinski, L., ‘Treaty Interpretation by the Inter-American Court of Human Rights: Expansionism at the Service of the Unity of International Law’ (2010) 21/3 European Journal of International Law 585. Lajous, Madrazo, A ‘The Constitutional Costs of the “War on Drugs” in Collins, J. (ed) Governing The Global Drug Wars LSE Ideas: Special Report (LSE Ideas 2012). Mass, F., ‘Alternatives to Indirect Control of International Narcotics Traffic’ (1975–1976) 8 New York University Journal of International Law and Politics 241. Makowski, K. W., ‘Narcotics Regulation: A Study in Irresolution’ (1960–1961) 34 Temple Law Quarterly 310. Mackenzie, J., ‘Pope Francis warns on “evil” of drugs, opposes legalization’ Reuters (20 June 2014). May, H. L, ‘Narcotic Drug Control’ (1951–1952) 29 International Conciliation 491. Mayss, A., Principles of Conflict of Laws (3rd ed, Cavendish 1999). McAllister, W. B., Drug Diplomacy in the Twentieth Century: An International History (Routledge 2000). McCoy, A., The Politics of Heroin: CIA Complicity in the Global Drug Trade, Afghanistan, Southeast Asia, Central America, Colombia (3rd ed, Lawrence Hill Books 2003). McLachlan, C., ‘The Principle of Systemic Integration and Article 31(3)(c) of the Vienna Convention’ (2005) 54 International and Comparative Law Quarterly 279. Miller, D. H., The Drafting of the Covenant, vol. I (GP Putnam's Sons 1928). Miller, D. H., The Drafting of the Covenant, vol. 2 (GP Putnam's Sons 1928). Morgan, E. M., ‘Traffic Circles: The Legal Logic of Drug Extraditions’ (2009–2010) 31 University of Pennsylvania Journal of International Law 373. Nadelmann, E., ‘Global Prohibition Regimes: The Evolution of Norms in International Society’ (1990) 44 International Organization 479. Noll, A., ‘International Treaties and the Control of Drug Use and Abuse’ (1977) 6 Contemporary Drug Problems 17. Pauwelyn, J., Conflict of Norms in Public International Law: How WTO Law Relates to Other Rules of International Law (Cambridge University Press 2003). Pauwelyn, J. and Elsig, M., ‘The Politics of Treaty Interpretation: Variations and Explanations Across International Tribunals’ in Dunoff, J. L. and Pollack, M. A. (eds) Interdisciplinary Perspectives on International Law and International Relations: The State of the Art (Cambridge University Press 2013). Pearshouse, R., ‘Compulsory Drug Treatment in Thailand’ (Canadian HIV/AIDS Legal Network 2009). Pfeiffer, S., ‘Rights of Indigenous Peoples and the International Drug Control Regime: The Case of Traditional Coca Leaf Chewing’ (2013) 5/1 Getting Journal of International Law 287. Pressly, L., ‘The Rehab Centres that Lock up Addicts against Their Will’ BBC Radio 4 (27 August 2014). Renborg, B. A., ‘Principles of International Control of Narcotics’ (1943) 37 American Journal of International Law 436. Renborg, B. A., International Drug Control: A Study of International Administration by and Through the League of Nations (Carnegie Endowment for Peace 1947). Renborg, B. A., ‘International Control of Narcotics’ (1957) 22 Law and Contemporary Problems 86. Room, R., ‘Addiction Concepts and International Control’ (2006) 20 The Social History of Alcohol and Drugs 2006. Room, R. and MacKay, S., Roadmaps to Reforming the UN Drug Conventions (Beckley Foundation Press 2012). Sabharwal, Y. K., ‘Keynote Address’ (National Seminar and Training Programme on Narcotic Drugs and Psychotropic Substances’, 25 March 2006, New Delhi) www.supremecourtofindia.nic.in/speeches/speeches_2006/ndps.pdf accessed 14 June 2014. Sadat-Akhavi, S-A, Methods of Resolving Conflicts between Treaties (Brill Academic Publishers 2003). Samuels, J. W., ‘International Control of Narcotic Drugs and International Economic Law’ (1969) 7 Canadian Yearbook of International Law 192. Saucier, R., Wolfe, D., Kingsbury, K. and Silva, P. (eds) ‘Treated with Cruelty: Abuses in the name of Drug Rehabilitation’ (Open Society Foundations 2011). Schabas, W. A., The Abolition of the Death Penalty in International Law (3rd ed, Cambridge University Press 2002). Shaw, M. N., International Law (6th ed, Cambridge University Press 2008). Simma, B. (ed), The Charter of the United Nations: A Commentary (Oxford University Press 1994). Sorel, J-M and Eveno, V. B., ‘Article 31: General rule of interpretation’ in Corten, O. and Klein, P. (eds) The Vienna Convention on the Law of Treaties: A Commentary, Vol. I (Oxford University Press 2011). Speaker, S. L., ‘“The Struggle of Mankind against its Deadliest Foe”: Themes of Counter-Subversion in Anti-Narcotics Campaigns, 1920—1940’ (2001) 34/3 Journal of Social History 591. Stanley, L. L., ‘Narcotic Drugs and Crime’ (1921) 12/1 Journal of the American Institute of Criminal Law and Criminology 110. Steiner, H. J., Alston, P. and Goodman, R., International Human Rights in Context: Law, Politics, Morals (3rd ed, Oxford University Press 2008). Stewart, D. P., ‘Internationalizing The War on Drugs: The UN Convention Against Illicit Traffic in Narcotic Drugs and Psychotropic Substances’ (1989–1990) 18 Denver Journal of International Law and Policy 387. Sunter, A. F., ‘The Harm of Drug Trafficking: Is There Room for Serious Debate?’ (2006–2008) 32 Manitoba Law Journal 174. Takahashi, S., ‘Drug Control, Human Rights, and the Right to the Highest Attainable Standard of Health: By No Means Straightforward Issues’ (2009) 31 Human Rights Quarterly 748. Takahashi, S., ‘Drug Control and Human Rights: Frequently Asked Questions’ (World Federation Against Drugs 2013). Takahashi, S., (ed) Human Rights, Human Security, and State Security: The Intersection, vol. 1 (Praeger, 2014). Tams, C. J., Enforcing Obligations Erga Omnes in International Law (Cambridge University Press 2005). Taylor, A. H., American Diplomacy and the Narcotics Traffic, 1900–1939: A Study in International Humanitarian Reform (Duke University Press 1969). Taylor, A. H., ‘The International Opium Conference’ (1911) 5/2 American Journal of International Law 466. Taylor, A. H., ‘The Traffic in Narcotic Drugs’ (1923) 2/3283 British Medical Journal 1053. Taylor, A. H., ‘The Traffic in Narcotic Drugs’ (1933) 2/3795 British Medical Journal 618. Taylor, A. H., ‘The Opium Evil’ (1924) 2/3328 British Medical Journal 678. Thirlway, H., ‘The Law and Procedure of the International Court of Justice 1960–1989, Supplement 2006: Part Three’ (2006) 77 British Yearbook of International Law 1. Thompson, N., ‘Detention as Treatment: Detention of Methamphetamine Users in Cambodia, Laos, and Thailand’ (International Harm Reduction Development Program 2010). Transnational Institute, ‘The Erratic Crusade of the INCB’, TNI Drug Policy Briefing, Nr (Transnational Institute 2003). Transnational Institute, ‘Treaties and Documents Concerning Opium’ (1909) 3/3 American Journal of International Law 253. Tzevelekos, V. P., ‘The Use of Article 31(3)(C) of the VCLT in the Case Law of the ECtHR: An Effective Anti-Fragmentation Tool or a Selective Loophole for the Reinforcement of Human Rights Teleology? Between Evolution and Systemic Integration’ (2009–2010) 31 Michigan Journal of International Law 621.
van Aaken, A., ‘Defragmentation of Public International Law Through Interpretation: A Methodological Proposal’ (2009) 16 Indiana Journal of Global Legal Studies 483.
van der Kruit, P. J. J., ‘Maritime Drug Interdiction in International Law’ (PhD thesis, Utrecht University 2007). Villager, M. E., Commentary on the 1969 Vienna Convention on the Law of Treaties (Martinus Nijhoff 2009). Villager, M. E., ‘The Rules on Interpretation: Misgivings, Misunderstandings, Miscarriage? The “Crucible” Intended by the International Law Commission” in Cannizzaro, E. (ed) The Law of Treaties: Beyond the Vienna Convention (Oxford University Press 2011). Volkow, N., ‘Addiction is a Disease of Free Will’ The Huffington Post (12 June 2015). Vranes, E., ‘The Definition of “Norm Conflict” in International Law and Legal Theory’ (2006) 17/2 The European Yearbook of International Law 395. Waddell, I. G., ‘International Narcotics Control’ (1970) 64 American Journal of International Law 310. Weber, A. J., ‘China's Future Opium Evil Problem’ (1919) 9/4 Journal of the American Institute of Criminal Law and Criminology 530. Windle, J., ‘How the East Influenced Drug Prohibition’ (2013) 35/5 The International History Review 1185. Wolfe, D. and Tomasini-Joshi, D., ‘Drug Users Burned by the System in Peru’, Open Society Foundation Voices (13 May 2012). Wolfram, K., ‘Conflicts between Treaties’ in Bernhardt, R. (ed) Encyclopedia of Public International Law (1984) vol VII, 467. Wolfrum, R. and Matz, N., Conflicts in International Environmental Law (Springer Verlag 2003). Wright, H., ‘The International Opium Commission’ (1909) 2/4 American Journal of International Law 828. Wright, H., ‘The International Opium Commission, Part 1’ (1909) 3/3 American Journal of International Law 648. Wright, Q., ‘The Opium Question’ (1924) 18/2 American Journal of International Law 281. Wright, Q., ‘The Opium Conferences’ (1925) 19/3 American Journal of International Law 559. Wright, Q., ‘The Narcotics Convention of 1931’ (1934) 28 American Journal of International Law 475. Wu, Z., ‘Arguments in Favour of Compulsory Treatment of Opioid Dependence’ (2013) 91/2 Bulletin of the World Health Organization 142. Young, R., ‘The Development of International Law: The International Control of Narcotic Drugs’ (1952) 38 American Bar Association Journal 778.